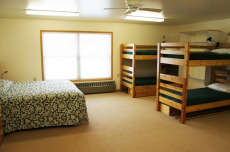 CAMP-of-the-WOODS offers great lodging options to meet your group's needs with comfortable hotel-style rooms, dorm-style rooms, and beautiful seasonal accommodations available along our 1400-foot beachfront and throughout the rest of Camp. During your stay you will also enjoy quality housekeeping service tailored to your group's needs. 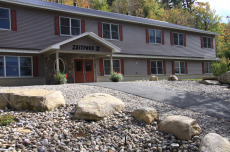 Brand new this year, we are excited to present Larsen Lodge, built in honor of Ralph Larsen, a friend of Camp and a Gospel Volunteers, Inc. board member. Just steps from the beach, this premium accommodation features six quality second-floor suites. 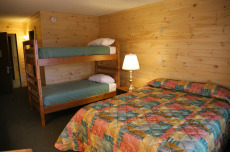 Each suite has a king bed, private bath, mini-fridge, a porch overlooking Lake Pleasant, and is air-conditioned. Accommodations throughout Camp, including beautiful beachfront accommodations, range from nice one-bedroom units with a queen bed to large two-room units with sleeping for up to 9. 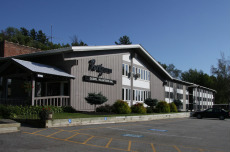 These units are available in late spring and early fall. For complete details on our Camp accommodation options click here. Note: Prices listed on these pages are for summer guests only. Please contact us for conference pricing and availability.